I talked about my wedding save the dates and invites yesterday. Today I will explain how I made the rehearsal invites and thank you cards. The point is - I had way too many invites, but since they are printed on nice kraft paper, I didn't want to waste them. So, for my wedding rehearsal invites I used the extra "glimpse" 4 x 6 cards. I created my text in Photoshop Elements and printed them out on card stock with crop marks . They measured 3.75 x 5.75 so they would be a bit smaller than the 4 x 6 cards. 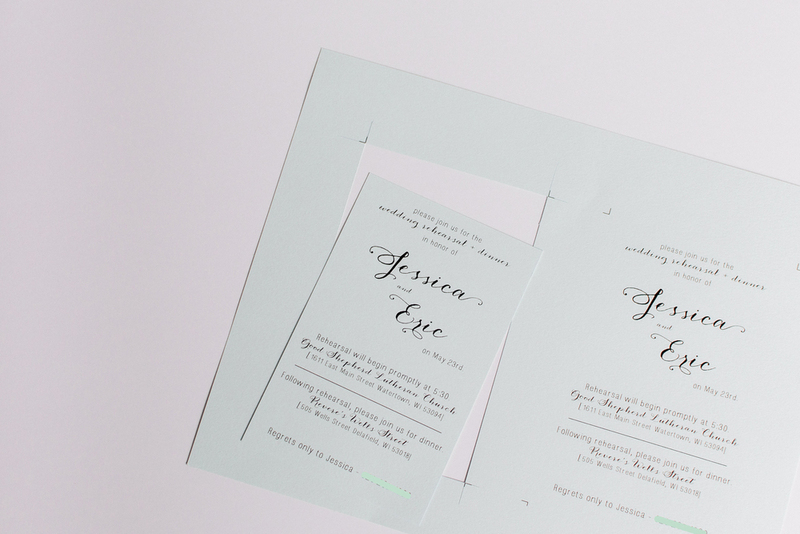 After they were cut out, I used my tape roller to adhere the new invite onto the old one. Since some people that were invited to the rehearsal were also invited to gift opening the day after the wedding, I printed out a little note to tie onto the invite. I took my Martha Stewart screw punch to put a hole in the middle of the note. The reason for using the screw punch instead of a random hole punch is so that the eyelets fit perfectly. The screw punch can create three different sized holes and for eyelets the middle [3 mm] punch works perfectly. To finalize this project, I strung some string into the eyelet and tied it around the invite - bow in the front and gift opening note in the back. To secure the pictures to the cards, I used black photo corners. To complete the card, I used my Martha Stewart stamp set [seriously you guys, I'm not being paid for all the Martha products I use - I just really like them] to stamp "THANK YOU" onto the card. The envelopes I used were Paper-Source 4 bar envelopes [in sage I believe? I could be wrong...].